Astronomers have used 15 years of X-ray data to make this video of the remnants of a white dwarf that famously exploded in 1572. Nearly 450 years later, the debris from the explosion is still expanding. 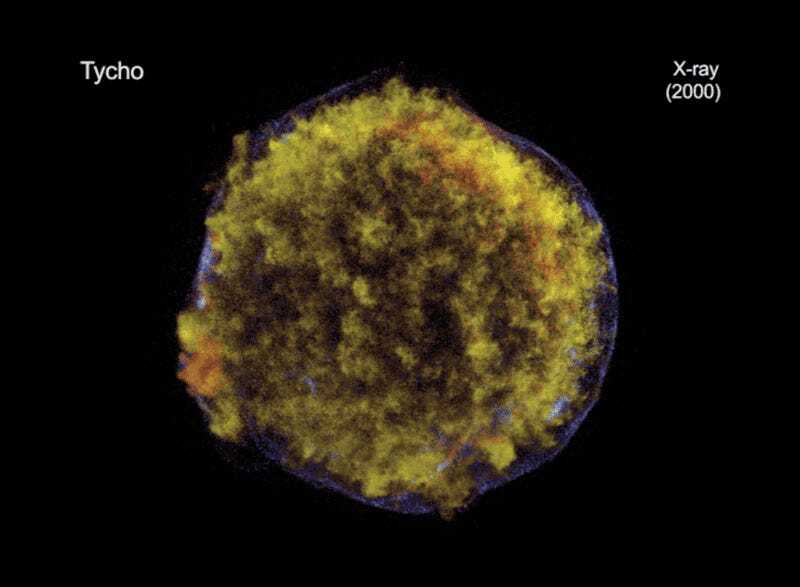 The remnants of the supernova is named after Danish astronomer Tycho Brahe, who witnessed the star’s explosion (so bright it was visible by day) and wrote a book about his observations. Located about 10,000 light years away, the supernova is clearly still unfolding, with the parts on the right growing about twice as fast as the parts on the left. Researchers—who made the video using data gathered from 2000 to 2015 by NASA’s Chandra X-ray Observatory—think the asymmetry is caused by different densities of the gas surrounding the supernova. It shows up well in X-ray light because so much of the exploding material has been heated by the shock waves. The scientists also measured the speed of the blast at different locations, and found that it had a maximum speed of about 12 million miles per hour.